It pains our hearts to admit this, but with the prices of prime real estate shooting up every year, it’s better to invest in a condominium unit than a car. The ideal condo would be in a prime location close to everything, with spacious interiors, great amenities, top-of-the-line furnishings, and gorgeous views of the city. A top priority would also be a parking lot for your trusty ride, which you’ll have to keep driving until you earn enough dough to upgrade to a new, sleek whip. But at PhilRealty’s most luxurious project, SkyVillas at One Balete, not only will your decked-out condo have an accompanying parking slot – you’ll also receive the ride of your dreams to park in it. 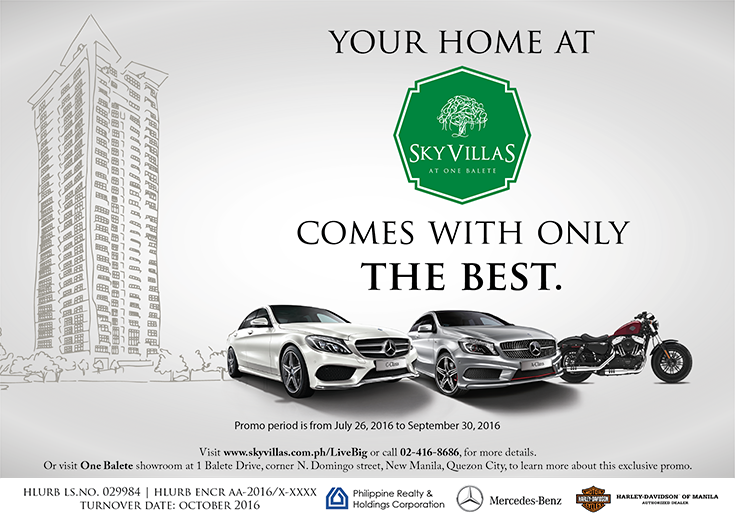 With every purchase of one of SkyVillas’ suites until September 30, you can get either a Harley-Davidson motorcycle or a Mercedes-Benz vehicle. 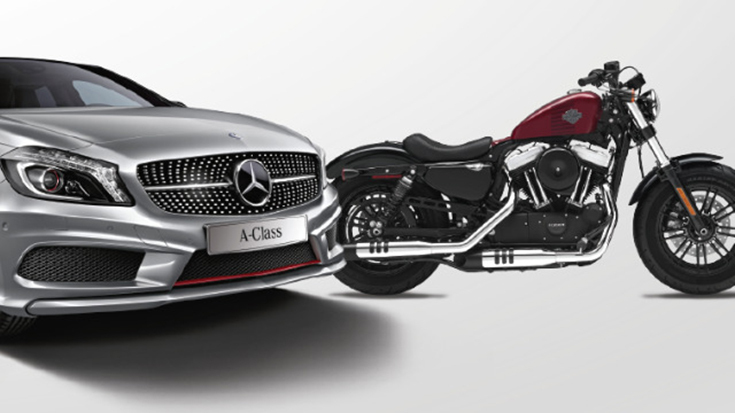 A one-bedroom suite will get you a Harley-Davidson Sports motorcycle, while a two-bedroom suite comes with a Mercedes-Benz A200 MG. Meanwhile, you will get a Mercedes-Benz C200 Avantgarde when you avail of a three-bedroom suite. All vehicles will come with three-year LTO registration and a two-year standard warranty. All you have to do is pay the purchase price of your chosen SkyVillas unit in full within 30 days from the date of your reservation, or pay a minimum down payment of 50 percent of the unit price upfront and finish your balance by the end of 2016. Judging by the selling benefits of SkyVillas, you’ll really be getting your money’s worth. It’s located at the corner of N. Domingo and Balete Drive in New Manila, with everything you’ll ever need within your reach, each floor only has two to eight apartments, ensuring SkyVillas residents’ privacy. The units are spacious, with high ceilings, floor-to-ceiling windows, and airy balconies. Each apartment also comes with SMEG kitchen appliances, Kohler and Grohe bathroom fixtures, Canadian Kitchen cabinets, split-type air conditioners, and multi-point water heaters. Plush amenities like a gym, a library, and a swimming pool will ensure that you’ll never want to leave. But when you do need to head out, at least now you can do so in a sleek, new ride you can call your own!